My Beatport DJ chart March 2015 is available! Some tunes are included in my Soundcloud Mix March 2015 aswell! My Soundcloud Mix March 2015 is available! My Soundcloud Mix Series is back with 15 fresh tunes mixed into just one hour! It features tunes and remixes by artists like Dimension, Bryan Kearney, Touchstone, Flynn & Denton, Ahmed Romel and many many more! Stream+Download enabled, enjoy! 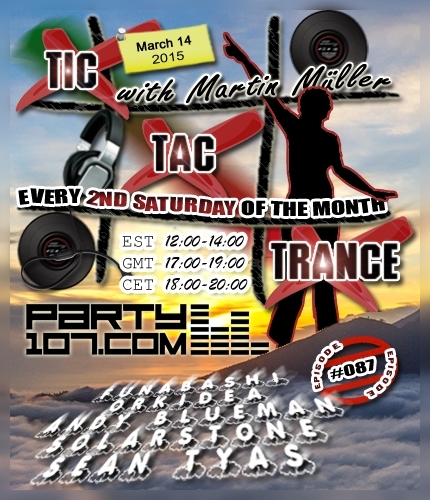 Tic Tac Trance #087 Replay available! Tic Tac Trance #087 is almost here! This episode will air on March 14 2015 on Party107.com and will feature new tunes and remixes by artists like Funabashi, Orkidea, Solarstone, Sean Tyas and a small showcase of Andy Blueman – 2002-2005: The Beginning and, of course, many, many more tunes! This time I’ve prepared a progressive, uplifting and psychedelic 2 hours underground trance journey. Make sure to tune in! Live tracklist updates are available HERE!